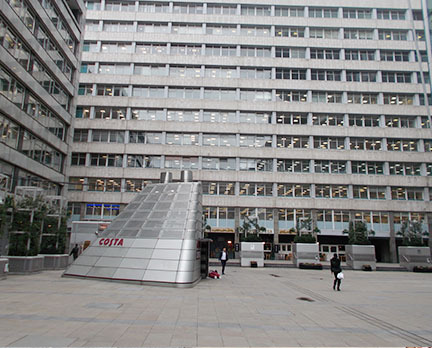 CityPoint Plaza is an existing open space located adjacent to CityPoint Tower in the City of London. 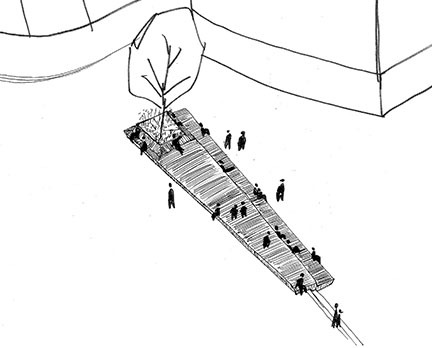 The public realm had become dated and under-used, cluttered with rows of planters, and raised vent shafts, kiosks and staircases making wayfinding difficult. There was minimal seating and a lack of programming in the space to make it desirable for people to use. 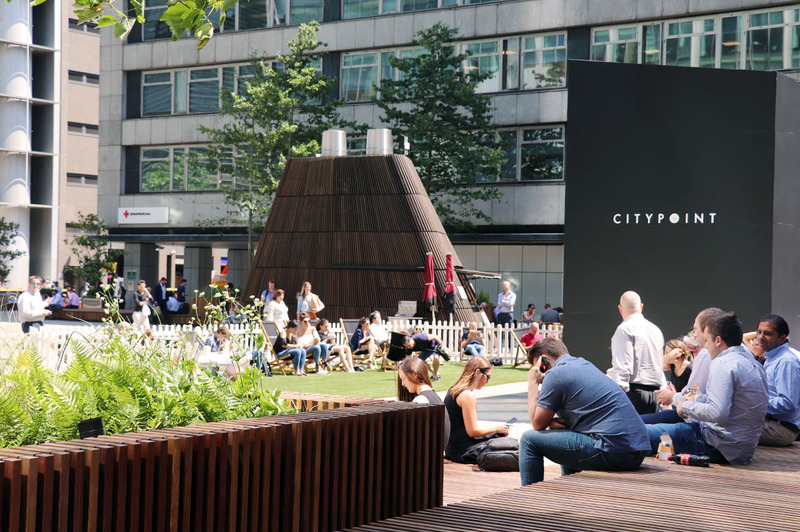 Brookfield Properties recently purchased the building, and working with Allies and Morison Architects, the brief was to reimagine the public spaces, vent shafts, kiosks and entry sequence into the building as part of a temporary landscape intervention. 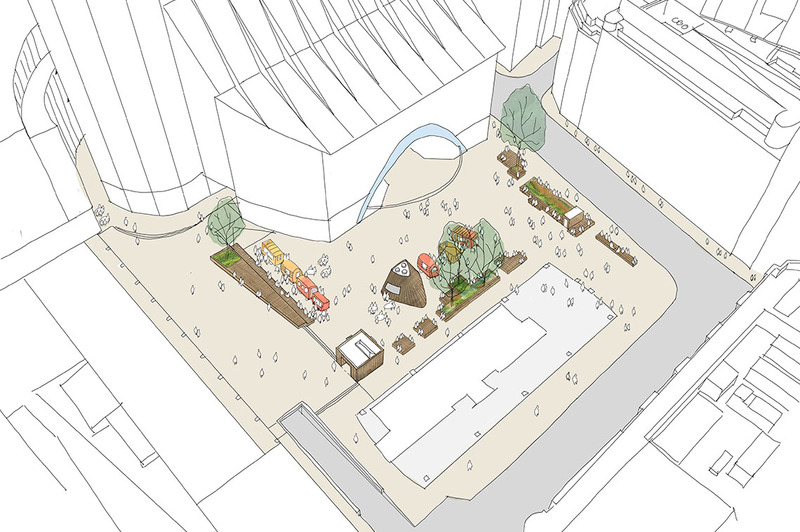 The vision for the plaza was to create a vibrant and active space with a sense of place in the City, to provide a positive connection from the surrounding streets and in particular, the connection from Liverpool Street Station and sightlines towards the main entrance of the tower. The designs were required to work with the restrictions on loading and build-ups from the basement below. 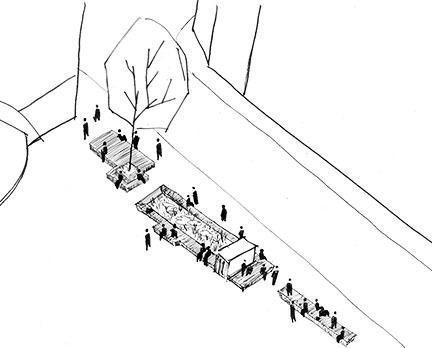 The surface finishes were to remain in-situ and new planters and trees were to sit on top. 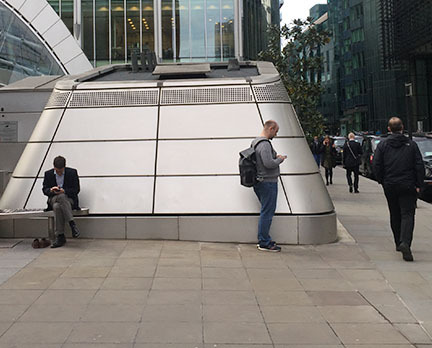 The stainless steel vent shafts that extruded through the surface were to be removed, however a new solution to allow for ventilation, while make the space more usable was requested. The designs also needed to be fabricated quickly to allow the spaces to be used for summer event programming. 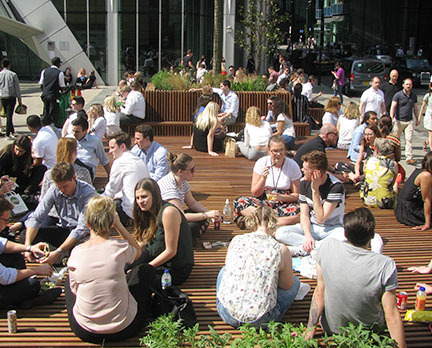 Three areas of timber deck frame the space around the entrance to CityPoint and define areas of activity where people can sit. 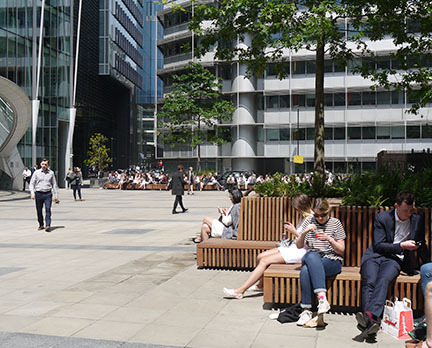 The arrangement of the decks is informed by the plaza's aspect in terms of sunlight, particularly at lunchtime when there are likely to the most amount of users. The decks also encapsulates the extent of the three main areas of existing vents which will be re-clad to complement the decking. 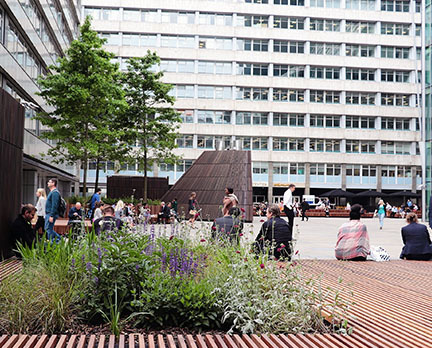 The introduction of natural materials helps to improve the materiality of the plaza and signals an invitation for people to use these spaces differently. 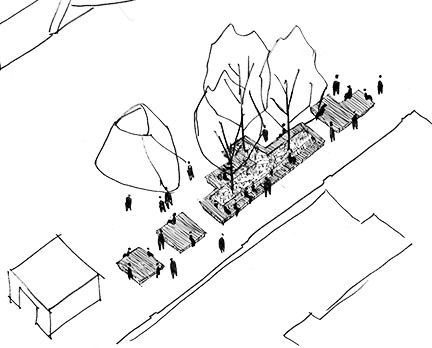 The platforms irregular shape maximizes the sitting edges that people can use while creating pockets of more intimate space within the plaza. 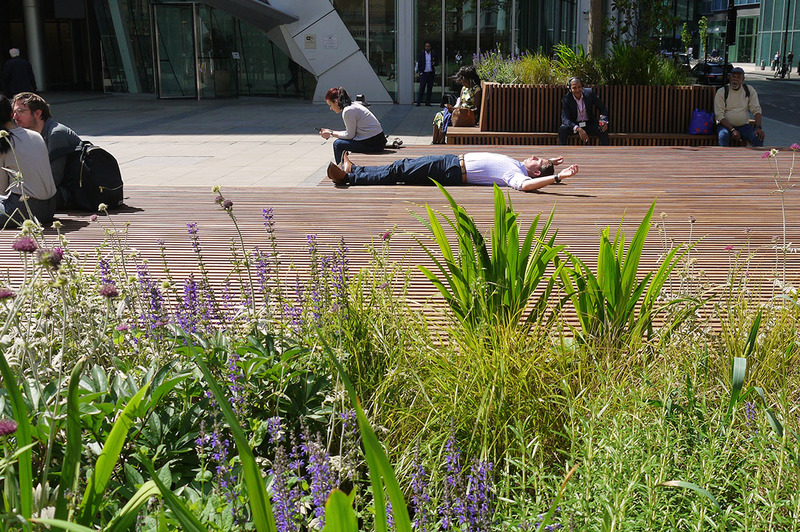 Planting is incorporated into the timber platforms to introduce more greenery, texture and life to the space, allowing people to sit amongst the tactile planting and pocket spaces. 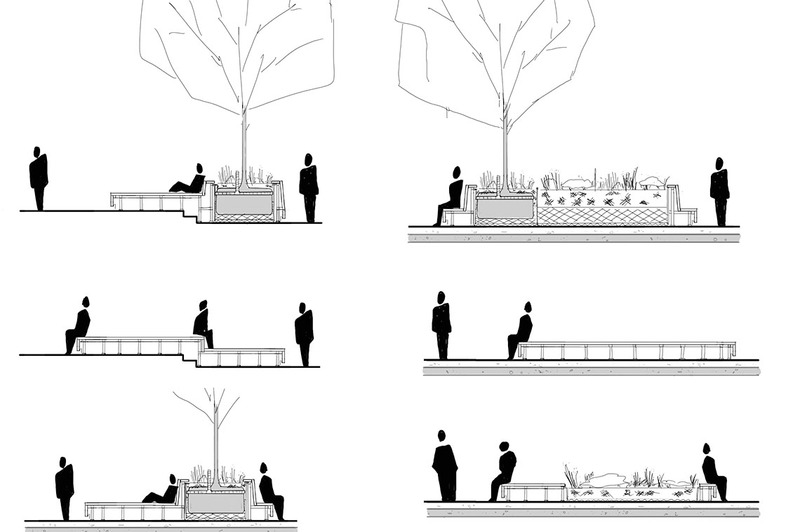 A line of trees along the eastern edge of the plaza provides an improved backdrop and creates more enclosed spaces for people to sit beneath their canopy. 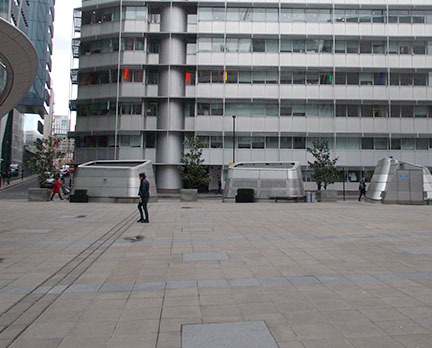 The plaza can be configured to host a variety of events. The central deck provides a canvas for performances and screenings to take place. Decks chairs could be added to supplement the raised timber seating for larger events. At lunch time street food vans can be parked in the central space allowing people to sit in the northern area which received best lunch time sun.